In honor of St. Patrick’s Day this week, I have chosen to highlight an Irish surname. The only problem with that is that I personally have no Irish ancestry. But my niece does from her mother’s paternal side! Countries of Origin – The surname MCGEEHAN is Irish. According to the World Names Profiler, Ireland has the highest frequency per million residents with this name at 49.37 per million. The United Kingdom comes in second at 10.9, and the United States is third at 6.9. Spelling Variations – Other variations of McGeehan include Mageean, Mageehan, McGehan, Mac Gaoithín, MacGeehan, MacGeehin, MacGeehon, and McGeehon. Surname Maps – The following map illustrates the frequency of the MCGEEHAN surname in Ireland in 1848-64. The numbers on the map show the number of McGeehan households in the county found in the Primary Valuation property survey of 1848-64 (known as Griffith’s Valuation). The surname name is found mostly in Northern Ireland. Distribution of the McGeehan surname in Ireland, 1848-64. 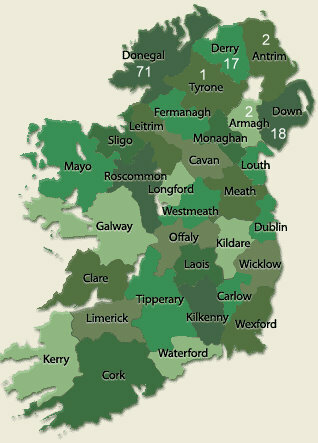 SOURCE: Irish Ancestors database, http://www.irishtimes.com/ancestor/surname/, accessed March 13, 2010. My Family -As I said above, I have no Irish ancestry. However, my niece’s 2nd great-grandmother was named Nellie McGeehan (1890-1920). Her father was Edward McGeehan, who was born in 1858 in Pennsylvania – likely in Philadelphia. Edward’s parents were born in Ireland. My Research Challenges – Right now the challenge with finding Edward McGeehan’s birth record is the fact that there was no civil registration required in Pennsylvania until 1860, two years after his birth. More information about Edward’s parents may be obtained from his death record, which I have not yet found. Census records have conflicting information, but Edward may have been a Philadelphia police officer. His daughter Nellie married William Lee. Unfortunately Nellie died at the age of 30, leaving behind a 10-year-old daughter, Catherine Lee. Surname Message Boards – Ancestry has a McGeehan message board as does GenForum. Links to posts about Irish Surnames and families I am researching for others can be found here. This post is #8 of an ongoing series about surnames. To see all posts in the series, click here. The Carnival of Irish Heritage and Culture is always a challenge for me; I don’t have any Irish ancestry! But sometimes I just can’t resist the challenge. Besides, genealogical skills and research techniques can be used in researching any ethnic background, right? Well, in trying to do my Carnival homework, that is, to work back a few generations on one branch of someone’s Irish family tree, I discovered that Irish research is hard! I’ve traced many a Polish and German immigrant, and even a few Hungarians and Italians, but most of those came to this country during what can be called the “Ellis Island era” – or, between 1892 and 1924. The few Irish folks I have tried to research are much older immigrants, arriving in the mid 19th century before both Ellis Island and Castle Garden and before detailed passenger arrival records. Because of this, I haven’t gotten back to Ireland yet…but I did trace back a few generations and develop a plan to further research this family. If you’re a regular reader, you probably know by now that my ancestry is Polish and Bavarian. But there is some Irish in the family, in a manner of speaking. My one niece is partially Irish – her maternal grandfather’s side is a mix of Irish and what I call “American”, for in tracing her grandfather’s surname, Rudolph, I am back to the 1700’s and the birthplace is still Delaware. But my niece’s grandfather, Ed Rudolph, never talked much about his German-American Rudolph ancestry – he always insisted he was Irish on his mother‘s side. I found him at the age of 3 on the 1930 Census and learned that his parents were Edward and Catherine Rudolph. Through sheer luck, the record also revealed Catherine’s maiden name, for 14-year-old “sister-in-law” Edna Lee was living with them. But is anyone Irish? Not yet…the Lee girls’ and their parents were born in Pennsylvania, as was Rudolph’s mother, and he and his father were born in Delaware. Looking back at the 1920 Census, both Catherine and Edna are living with their parents, William and Nellie Lee. The ages match the facts in the 1930 Census, and there are no other families with similar names and ages. In another stroke of luck, Nellie’s father is living with the Lee family – Edward McGeehan. William Lee and his parents were born in Pennsylvania. Edward McGeehan was born in PA, but his parents are from Ireland. In 1910, the McGeehan’s are being elusive; there appears to be a match in a New Jersey town close to Philadelphia, but the ages are slightly “off” and more research is needed to straighten it out. However, William C. Lee, wife Nellie, and young daughter Catherine are living with their in-laws, Frank and Sophia Beatty. The 1900 Census explains this relationship further: Sophia and William C. Lee are siblings, the children of widower Christopher Lee. Christopher was born in PA in 1854, but his father is from Ireland. Technically, what I described above “counts” as working back a few generations on an Irish family tree. But I didn’t know who the Irish immigrants were yet, only who their children were. In looking at my niece’s great-grandmother, Catherine Lee Rudolph, I had two choices for researching Irish ancestry further. Catherine’s paternal great-grandfather was the Irish immigrant who was in Philadelphia by July 1854 for his son Christopher’s birth. Similarly, Catherine’s grandfather Edward McGeehan was born in Philadelphia in 1858 to Irish immigrants. Could I find out more about either the LEE or the MCGEEHAN families? I hope I can, but the limits of online research may be exhausted. For Christopher Lee, further Census research revealed that his wife’s name was Catherine, and they also had a daughter named Catherine born in 1879. As Christopher is a widower by 1900, it is assumed that Catherine died between 1887, the year their son William was born, and 1900. The death records for Philadelphia at Family Search reveal some possible matches, but the record does not contain definitive information (for example, it includes the fact that the person was married but not the spouse’s name). I found Christopher’s own death record in 1911, but it does not list his parents’ names. On the 1870 Census, instead of a 16-year-old Christopher I found a 19-year-old living with 31-year-old Thomas Lee, a gardener, and 20-year-old Mary A. Lee, a domestic servant. Thomas is listed as having been born in Ireland. If Christopher is really 16, it is possible that Thomas is his father, but not if Christopher is 19! Mary may be a sister. Going back to the 1860 for clarification, it gets more confusing. Instead of finding a young Christopher, there is a 50-year-old Christopher Lee, born in Ireland, with a wife Catherine and sons Charles and Walter. A search for Thomas Lee revealed many matches, but none that match with the previous info or also contain a young Christopher in the household. More research is definitely needed to sort out all of the Lee families living in Philadelphia during that time. One problem is that birth registration was not required in Philadelphia until 1860 – Christopher was born in July 1854 according to the 1900 census, or in July 1853 according to his death certificate. The only option would be to determine where the family lived and search for a baptismal record. The McGeehan research also came to a halt because of conflicting information in the census records. There is also the same problem with vital records as Edward was born around 1858, prior to civil registration requirements. However, he is still alive in 1920 at the time of his daughter Nellie’s death, and the death records after this date contained more information. It is possible to find his record to yield his parents’ names. Another lead is that one of the inconclusive census records shows a young Edward as the son of Edward McGeehan, an Irish immigrant who is a Philadelphia police officer. As Edward Jr’s son-in-law William Lee becomes a police officer as well, it is possible that this is the correct family and that both Edward and his father Edward were police officers. This is another path of research to pursue. Thanks to my Irish genealogy homework assignment, I learned that Irish research is difficult! First, the names are more common than some of the Polish and German names I have worked with in my family tree. There are several Lee and McGeehan families in Philadelphia during this time period, so you can not rely on census information alone. Second, because the immigrants came to the U.S. in the mid 1800’s, they are not as easy to pinpoint as my later immigrants who had such records as detailed passenger arrival lists, draft registration cards, and social security applications to lead the way to their hometowns. Third, once you need birth records that go beyond when birth records were officially kept, it is obviously more difficult to trace. Continuing with my niece’s maternal ancestry will be difficult, but challenging.